Among different types of loans, personal installment loans allow you to repay over a period of time in terms of regular monthly payment. It has become a popular way to sort out payments as the nature of installments improves borrower’s liquidity and results in a higher flexibility on the use of the loans. It also widens monthly budget, giving borrowers chances to tide over unexpected expenses or merely create an emergency fund. With a sophisticated financial system, many of the banks in Hong Kong provide personal installment loans and other types of bank loans for clients with stable jobs. These are normally unsecured loans that do not require any collaterals or guarantors. Loans are granted based on borrower’s credibility and ability to repay the debt. With the advancement in technology and communication system, personal installment loans nowadays can be applied through hotline or internet. This makes it easy and prompt to obtain while the pressing financial need emerges. When choosing among lenders, it is important to opt only for the reliable and responsible ones, such as banks with reputations. Bank loans are offered under various conditions and also incur different cost of borrowing. The monthly flat rate, annualized percentage rate, service charge, credit period are all to be considered before borrowing. For example, the China Construction Bank (Asia) offers personal installment loans up to 1.2 million Hong Kong dollars for the purpose of improving liquidity. It serves as a prompt help when borrower has the need of fast cash in fulfilling certain goals, such as investment, education, housing, health and marriage. Such loans do not incur service charge or handling fee and thus, the cost of borrowing is lowered. On the other hand, the bank provides a monthly flat rate as low as 0.18% and the annualized percentage rate of 3.32%, further reducing the amount of repayment. To facilitate borrowers who need more time for repayment, the bank offers up to 60 months of credit period. In order to minimise borrower’s cost, banks would also offer limited and exclusive privileges to clients. 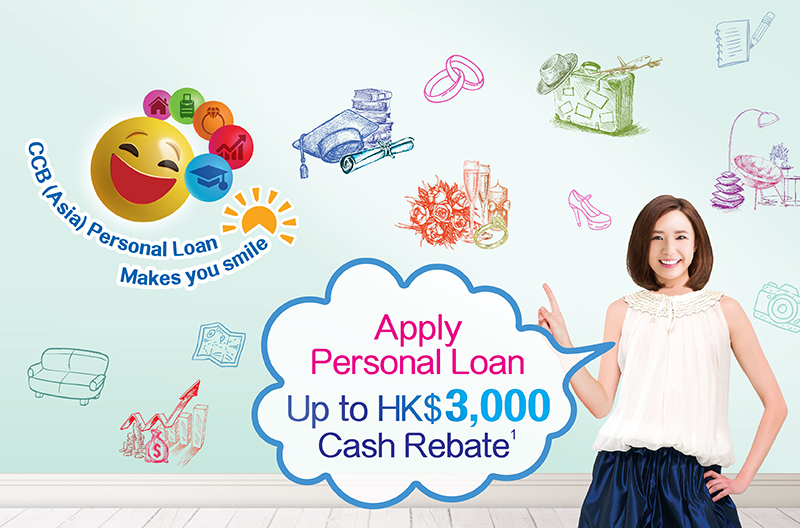 The China Construction Bank (Asia) is launching a special offer on personal installment loans. Clients carrying out loan drawdown can enjoy up to HK$3,500 cash rebate and a HK$500 on top if they opt for designated bank services. An addition of HK$500 supermarket cash coupons are offered to encourage the use of online application. Simply fill in the application form online or call the hotline to enjoy a simple and stress-free ways to obtain loans. The loan centre manager would contact you directly and have discussion on details of approval. Consolidate your credit cards loans or other debts by personal installment loans today and achieve a better interest rate! © 2018 China Construction Bank (Asia) Corporation Limited. All rights reserved.